I've neglected my polymer clay beads for a while and have now decided to start using them again. Here we have really fresh looking spring tone diagonally threadled polymer clay lentils in a milky green background with lilac,lavender,mauve and white flowers. Matching swarovski brios in amethyst (although they look like iolite in the photo) and peridot and czech glass beads in the same colour zone. This spring bouquet drops at 6 cm and is complete with 14kgoldfilled earwires, wires and pins. 925 silver chain and goldplated leaves. 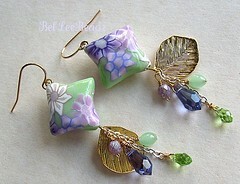 For a limited period, I'll be offering these polymer clay earrings at a special price. Published price is the price after 'discount'. The same quality materials and craftsmanship is to be expected so there is no compromise in quality even though the prices have been reduced for this period. All clay beads used are handmade by Karin.